In 2012, the new Fundamental Law of Hungary called the attention of Europe and the world to many new questions. Traditional concepts of constitutional law are going through significant change in the 21st century. It has become necessary to rethink doctrines we previously accepted as singular and single truths. The issue of constitutional identity is gradually moving to the foreground for the Member States of a unifying Europe. It is a concept, however, which remains the topic of widespread academic debate as to its elements and content. In contrast, the European Union seeks to find the framework of national identity in its jurisprudence. 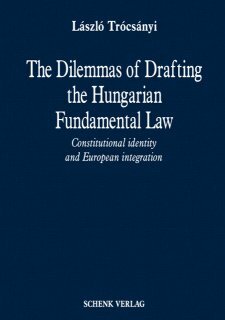 The new Fundamental Law of Hungary, primarily due to its unique tone, became the subject of investigation by the several “public law laboratories” of Europe. Domestic and European fora raised their voices on the Fundamental Law; new forms of participative democracy—mainly expert bodies—issued expert opinions on the Hungarian constitution. These often conflicting opinions call attention to the fact that there indeed are parallel, multiple truths and that those interested and engaged in politics and constitutions find themselves facing brand new dilemmas. This book intends to introduce some of the main points of debate sine ira et studio, that is, “without hate and zealousness”. These arguments are put forward with the intention to create some sort of a “constitutional dialogue” on these issues.